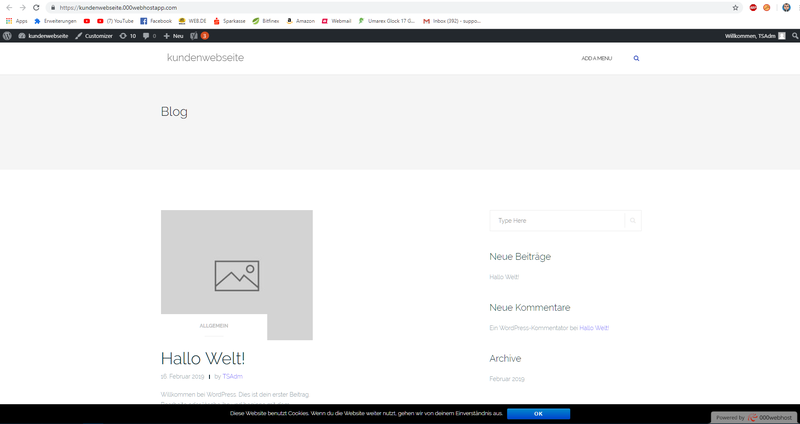 Webseite lädt nicht mehr ! Von heute auf morgen? ich habe ein Problem bzgl meiner Webseite, diese lädt von heute auf morgen nicht mehr ohne irgendwelche Fehlermeldungen anzuzeigen. Sie lädt unendlich lange ohne Reaktion. Seit ich sie das letzte mal geöffnet hatte wurden keine Änderungen vorgenommen. Über hilfreiche Tipps wäre ich sehr erfreut. Please IGNORE any suspension emails if you get any. All right, I’m very confused because my account has now been announced offensitlich? And I do not know why. Yes ignore the suspension emails. So after a little investigating I can say that the website isn’t loading due to a database limitation. I have suspended your site to hopefully aid the resolution of this issue. I will check back here in 4-5 hours. 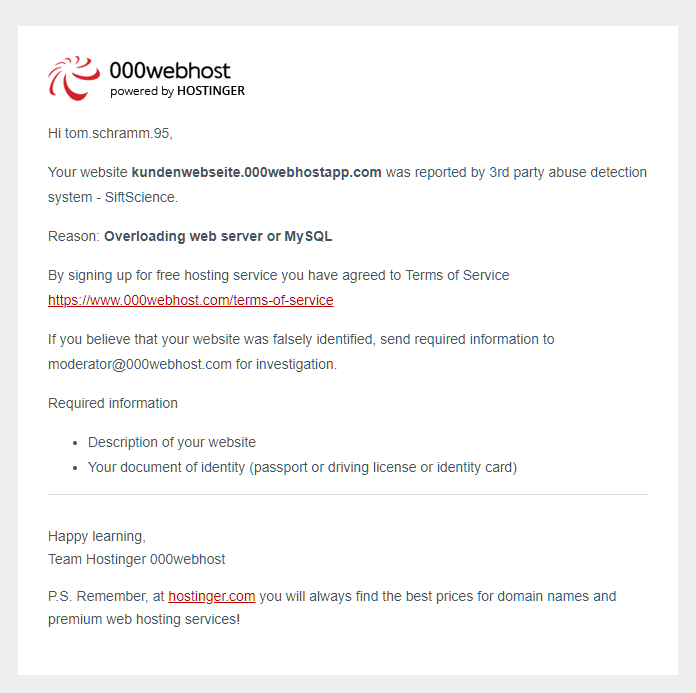 How long does it take to get back to my 000Webhost Account ? How long you need to activate them again ? I need this Website as fast as possible its so much work… please help me Admins ! I see your site is loading now and database accesses without issue. thanks so far for the quick help! Unfortunately, all my website content is now deleted. 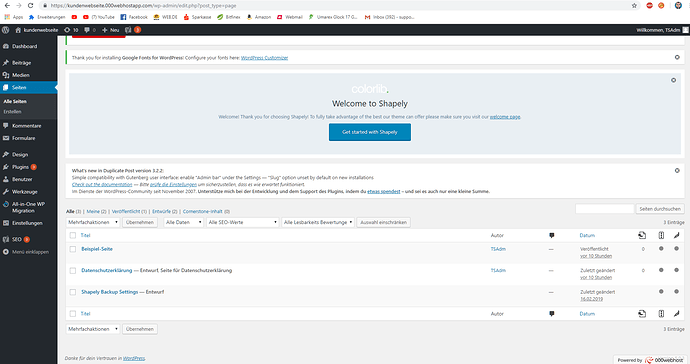 I now have a new wordpress but all work is gone … Is there a way to reset the database at the time everything was still running? I would be very grateful for another help or answer. When you enter phpmyadmin does your database content still appear? If the content is in the database you should be able to still use the data, make sure wp-config.php contains the correct username and password + database name as well? but it seems like the pages and the content are gone. In the folder WP Content are as far as I see all the pictures, plug-in etc. available. It seems like the database is destroyed. Unfortunately I can not find a single page anymore: / Is there no way to restore the database? Maybe when I upgrade to Premium? The data is incredibly important … I would give anything to get this back. I’ve had a hunt and the database as you say seems to have reverted to default like a fresh install almost, while the File Manager offers the plugins/themes still there etc. Have you ever taken a database backup at all?